It's mid-morning and the team is still at the hotel. We are scheduled to brief at 1300, and continue with the Freestyle at 1400. The weather looks OK. Yesterday, was a no fly day. 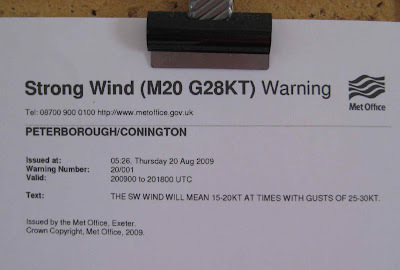 England was forecasted to be hit with the remnants of hurricane Bill. It was blustery and wet, but not as bad as expected. The Team members elected to travel locally to see the sites. David and Martha invited Debby and me to visit Blenheim Palace, the birthplace of Winston Churchhill. It is a magnificent palace on beautiful grounds. We had lunch in the Palace and then took the tours. Afterwards, all of us were invited to Nigel Lamb's (Red Bull Pilot) home for refreshments and dinner. Nigel and his lovely wife, Hillary, were great hosts. We shared many flying stories (a few about Kirby), and several glasses of wine. Nigel and Hillary, thank you for a fantastic evening!!!! We then returned to the hotel, and called it an evening. As you may have already seen from the scores, your team did a very good job in the Q program. When the results were in, Jeff was in 4th place followed by Goody in 9th, Michael in 14th, and David in 15th. Debby, Hubie, and Robert each flew well, in my opinion, but the judges disagreed with me. On Tuesday, we were able to fly the top 11 pilots on the start of the freestyle. Then darkness ended the day. We will restart the remaining pilots in a few hours. Unfortunately, Goody had more than 1000 penalty points during his flight. He had some outs, but the radar tracking system being used to track penalties captured him low on several figures. You just can't push the bottom of the box in international competition, especially when the tracking system is accurate to within a centimeter or two. Now, our team is going to need some help from the British Team, and a great flight from Jeff in order to bring home a team medal. Jeff has been flying very well. I know he will do well for you. Wish them good luck. More later. Most, if not all, of you who have been following this blog are probably aware that we lost Vicki Cruse in an accident, yesterday. Vicki was performing her "Q" flight in front of the judges when she was unable to recover from a 1 1/4 snap on a downline. The plane crashed on the grass inside the racing circuit. No one on the ground was injured. Assistance was at the site moments after the crash, but the impact was not survivable. Many of the competitors from around the world witnessed the accident. All are heart broken. Many have offered their condolences to the team and Vicki's family. All flying has been suspended until an investigation has been completed. The team members have met with the local police and the British Air Accidents Investigation Branch. A meeting of the team managers was conducted this morning, and all voted to continue the contest in Vicki's memory. I know that Vicki would have wanted the contest to go on. The contest organizers will restart the contest on Monday afternoon, weather permitting. Due to other Silverstone commitments, there will be no flying on Wednesday and Thursday. The contest will be shortened, and most likely will include the results of the Q program and the Freestyle. The 4-Minute Freestyle will be flown on Saturday. I have had the honor to have known Vicki for 14 years. Both of us flew Christen Eagles in competition, and later, the Edge 540s. We traveled to contests from California, Oregon, Washington, and Arizona to Nebraska, Oklahoma, Michigan, Wisconsin, and Texas. She flew contests in many other states, in addition. I will never forget the memories of flying on her wing tip to or from a contest, meeting new friends, and seeing old friends. Vicki was an extraordinary person. She was bright, street smart, unassuming, and possessed a twisted sense of humor. Many of you know how much she enjoyed pulling a prank on any one of us. I will miss her, greatly. I feel very lucky to have been one of her close friends. I am sure that you share my sentiments. The morning briefing began promptly at 8 AM in the briefing tent. Clouds were not an issue. The winds at 500 meters were within limits at 11.3 m/sec. The warm up pilots were launched at 9 AM. Then scud started coming into the box. A few moments later light rain began to fall. Now, we are on a weather hold, and it is raining. The forecast for later today is for isolated showers. It's not looking all that well, but tomorrow's forecast is more promising. Oh, well, weather can always change. Now you know why it takes 10 days to fly a WAC. If this weather keeps being uncertain, the team and I will need you to send more money in large denominations. 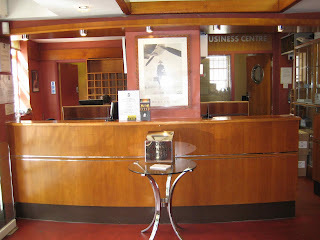 At the top of the blog is a picture of a coffee machine that is in the lobby of the hotel Also, there is a similar machine at the Briefing Tent. It is really cool. There are about nine different buttons that you can press to select coffee, lattes, capucino (sp? ), etc. You can also make your selection double strength. The process takes about 10 seconds, and it tastes pretty good. Way cool. My coffee group at the San Carlos Airport needs one of these. I will update this blog later today as something happens. Just prior to the 1PM lunch break, we were able to fly the warmup pilots and contestant #1. Lunch was from 1300 to 1400. The next pilot was in the air by 2 PM. When I left the airport about 6:15 PM, we had flown through Goody Thomas #21, and the plan was to stop at pilot #28 and 7 PM. The contest is finally underway, and there are happy pilots at Silverstone. Two of the US pilots have flown: Robert Armstrong and Goody Thomas. Both flew very well, but Robert received a 150 point penalty for not doing three wing wags on a free break. The scores will be posted and you can go to http://www.wac2009.com/ and see where everyone stands. You should also be able to link from this site, but I have not had an opportunity to check it. Tomorrow, we may complete the Q program. Vicki will be the first US pilot to fly. Michael next followed by the rest of the team. Wish them well. They are going to make us proud. 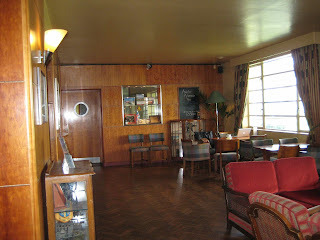 This morning I am typing from the hotel lobby at an amazing airport called Sywell. 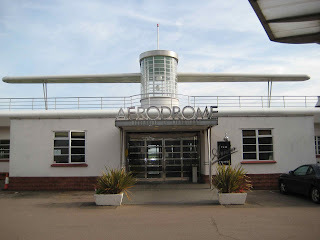 This airport is unreal, the runway is a huge grass strip and the facilities look like they are from the 1940’s. I am including a few photos here to get the point across. As I sit typing, sipping tea and trying to find a magneto, I am listening to Ella Fitzgerald and Frank Sinatra played in the background. The British team is still here practicing and it was nice to see them. They are aware of my magneto problem and have offered some possibilities for me, which is great. Len, Hanspeter and I headed out very early this morning for Sywell. Hanspeter/Debby’s plane is here and Len will be fixing the broken rudder pedal and then he and I will head to Conington to work on the Edge. Both mags are off and are being taken to a shop that overhauls Slick mags. The local mechanic at Sywell here offered to pull two new mags off an Extra he has sitting here and give them to me, but only the right one matches the Edge magneto. Here is a photo Julie took of Robert, Me and Len outside the terminal. Julie flew the US flag for us today; Robert announced is as we were reclaiming the place, formerly home to the 457th Bomb Group and known as Glatton. The right mag appeared around 3:30 pm and went on promptly. A test run of the engine revealed no change in the engine. Robert decided to go back to Silverstone where he would just be slightly late for the 5:00 pilot briefing. 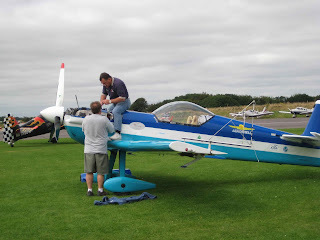 The engine ran slightly better at higher power, so Len suggest I fly it around the pattern, which I reluctantly did. The engine ran ok, but three cylinders were quite hot. We did another run up on the ground, but the results were the same. So we decided to get a new left mag and try that. While waiting for the mag, Len and I went out for a quick sandwich at the local pub. The new mag arrived around 6 pm. Here is Joe putting on the magneto. After putting on this mag, we had high hopes for a smooth run. An engine run revealed that once again, the engine was not running well on the left magneto. Now we were getting stumped. Len decided we should check the fuel injectors, so they were removed and small bits were found in a few of them. Robert previously found some contamination in his fuel, so we sumped the tanks and found the same thing Robert had. 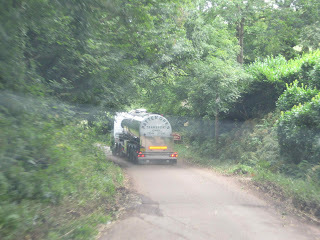 We drained several gallons of fuel, pushed it outside and started it up. We were thinking positive, but the engine still would not run properly. 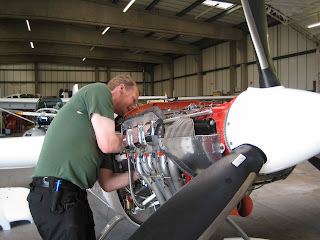 After more thinking, our next step was to remove the p-lead from the left mag, being very careful not to bump the prop. An engine run this time found a perfectly running engine. At least we were getting somewhere. Len decided that having the plane in the contest hangar with the p-lead off was not a good idea. The planes are moved about to get others out and this was not the safe way to go. Joe hooked the p-lead back to the magneto and we kept working. Our next task was to suspect the ignition switch. Don took the ignition switch out of his airplane. Len and Joe replaced the ignition switch and Len hopped in to try it. The engine ran horribly, just like before. Now we were all stumped. However Joe suggested we remove the wire to the Slick start shower of sparks. Len started the engine and it ran perfectly. It was 9:00 pm and Don, Joe and Henry were still there helping. We had finally found the problem. In the morning, we will remove the left mag and put the old one back on (so I do not have to buy two new mags), as well as the borrowed ignition switch. Len will try to start it without the shower of sparks and we will see what happens. 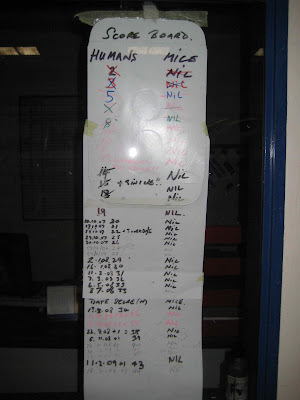 After our discovery, we closed the hangar and everyone went home. Len and I headed back to the hotel (just over an hour) were we were able to catch the last 15 minutes of the Opening Ceremony and share a creme brule Norm had saved for dessert. The short answer is that there wasn't any action. The Pilot's Briefing began at 8 AM. The 500 meter winds were already above the 12 m/sec limit. This put us on a weather hold until 12:45 PM. In the meantime, we had a cold frontal passage with some light rain. The winds continued to increase as forecasted, and by 3 PM the organizers cancelled the day. On the good news side, Vicki got her plane fixed and returned to Silverstone. The winds are forecasted to diminish some by tomorrow. There is also the possibility of some rain in the morning. Hopefully, we will complete some flights by tomorrow night. This is not atypical of the World Championships. It seems that it is often the case that we have cloud or wind issues that stop the contest, even though we might be flying at a contest in the US. 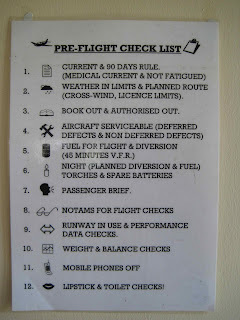 The international rules are written to try to fly pilots in similar weather conditions. Let us hope that tomorrow offers flyable conditions. 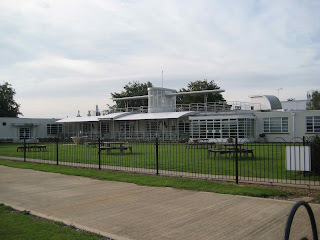 Monday afternoon, the team successfully and safely relocated from Dunkeswell to Silverstone, England. The pilots in planes made the trip in 40 minutes, while those of us on the road took slightly over three hours. 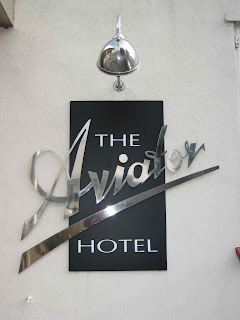 The pilots where met at Silverstone and taken to the hotel, which is very nice. 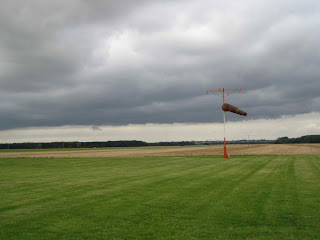 After being asked to stop flying in Dunkeswell, the Contest Director, Steve Green, was contacted, and quickly went to work to find an alternative site for practice. He was able to receive permission from the people at a former WWll field south of Peterborough. 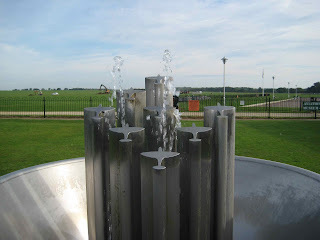 This airport was named Glatton during WWll and B-17s were based there. All of the fields we have flown from are former Army Air Corps bases with a lot of history. 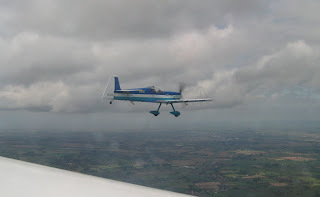 So our plan was to fly Tuesday morning practice flights in the Silverstone box, then fly at the Flying Club Conington (EGSF) for the afternoon practice flights. The morning practice flights went on schedule for everyone, except Debby. Debby is sharing Hanspeter’s plane, and the two of them were practicing at another field. Debby’s Silverstone practice time is late on Wednesday. 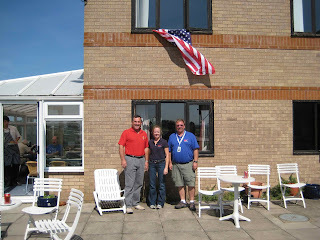 By noon, we were ready to leave for Conington with Debby joining Hanspeter. 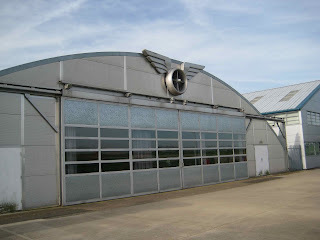 Conington is about 30 miles East of Silverstone, or 15 minutes by air. It was about an hour and a half by car. We arrived and began the practice rotation after a briefing from Julie Churchill. Now the day got “interesting”. Three flights into the rotation, Debby called with a rudder peddle problem in the CAP 232 at the airport she was at. The problem grounded the plane. 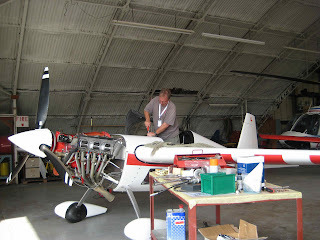 Our unflappable team mechanic, Len Rulason, was immediately dispatched to fix Hanspeter’s plane. Twenty minutes after he left, Vicki started up for her flight. Upon her run-up, she discovered a dead left magneto. (This violated the Chenoweth Second Axiom of Flight: “Never do a mag check away from your home field”). Vicki’s flight was scrubbed. Fortunately, there was a mechanic on the field. A replacement mag was located, and should be installed this morning. Len and Vicki are on the road as I am writing. Len arrived at Debby’s field, identified the problem, and then went to a local bicycle shop for parts. Evidently, the CAP 232 used a part on the rudder peddles that is also used for bicyclists to attach their shoes to the peddles. Who would have guessed? Len finished the fix in the hotel bar last evening. Hopefully, Debby and Hanspeter are now able to get back in the air. At 1700 hours today, the mandatory pilots briefing will be held at the field. The order of flight for the Qualifying Program will be drawn. At 2015 hour, the Opening Ceremonies will begin followed by dinner. Tomorrow, the first competition flights are scheduled to begin. Everyone is excited to begin the WAC. Today we arrived at an overcast airport and started flying about 11:30 or so with Peter from Slovenia. Next up was Jeff and during Jeff’s flight, Brendon the airport manager pulled Norm aside and told him the flying had to stop. The locals had won and that was it for us. If we kept flying, the airport might suffer some repercussions from the community and no one wanted that. 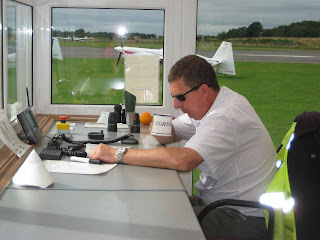 Norm and Robert worked on alternatives with the contest officials, while the rest of us had lunch, fueled up for the trip to Silverstone and paid our bills. 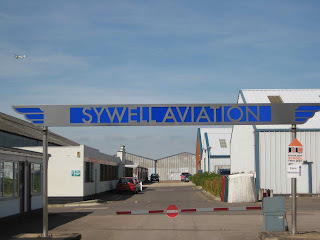 With fees for the hangar, landing and box entry fees (yes, a charge each time we flew in the box) plus the fuel and oil bills, we left quite a mark on Dunkeswell. I came in at $1100. We didn’t have to wait too long before the rest of the team arrived by car. We were also informed that we would be given an alternate practice site tomorrow because of the poor weather and noise issues at Dunkeswell. Silverstone is a year-round race track where a Formula 1 race is held (though I am told perhaps no more) so cars are racing around us and we are in the center of the complex. It is quite an interesting venue. I will try and get some shots of the site. 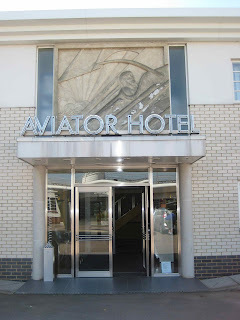 Silverstone is about 35 minutes (with no traffic) from the hotel. We actually found it right out of the gate. We all checked into the hotel and registered for the contest. Dinner was served and old friends were met. Our team practice times are tomorrow morning, so it was an early night. Today started out with the usual fog and now the daily Starbucks visit. However Debby and I had to wait about 20 minutes for the 9:00 opening. Norm, our Team manager, must have read the blog, as he went to McDonalds this morning for his treasured orange juice, the British version with “no bits”, and an artery-clogging Egg McMuffin. We headed out to the airport a bit later than normal, due to the request for no flying allowed before noon. Shortly after hitting the main road to the airport, we discovered we were following this truck which was moving quite fast on a single lane road. I told Norm this was a great thing; this guy could be our lead anytime as we would no longer have to worry about oncoming traffic. Being a tanker truck, we assumed this might be the source of the missing 120W oil for Hubie’s Sukhoi, however it turned off before getting to the airport. Hanspeter was up first this morning with about a 1500 foot ceiling which got up to 2000 by late afternoon, but didn’t allow any of us to fly a full sequence, just figures that had to start at 100 to 200 feet. We all should have been given air show waivers for today, we earned them. Just after the first rotation, we were informed that the flying must stop at 5:30, so we switched to tightly controlled 10-minute slots. Jeff, being the last in the rotation, gave up his slot to keep within the time limit. Robert had some airplane issues today. He and Len tried to figure out the problem. Finding nothing wrong, Robert flew the second rotation. Today was a real zoo, aerobatics, normal arrivals, and parachutists. All of this really gave Brendon a workout as the radio (unicom) guy today. 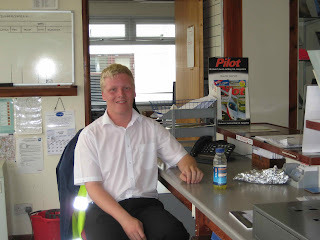 Here he is on the job at about 1:00, looking quite fresh. This photo was taken at 4:20 pm. He said that was tea, but after today it was probably something a lot stronger. Though the photo doesn't show it, he was looking quite disheveled. With Brendon on the radio, this left Curtiss to handle the phone calls, otherwise know as noise complaints. Here is Curtiss when not on the phone. 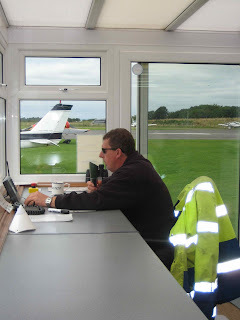 Richard is the third guy here and he handles the phone and collection of landing fees when Curtiss is manning the fuel pumps for us. Nicolette had the day off.